Every year, the average Australian household produces enough rubbish to fill a three-bedroom house. That’s about 2.25 kg of waste per day. We send an increasing amount of rubbish to landfills every year, and without proper rubbish removal management, it could very well lead to extreme environmental degradation. For this reason, a clamour to change the ways in which Australians deal with waste is emerging. In order to ensure environmental sustainability, recycling waste has been encouraged by both local and national Governments alike. Here at Lake Macquarie Skips, we support the advocacy for responsible waste removal and management. 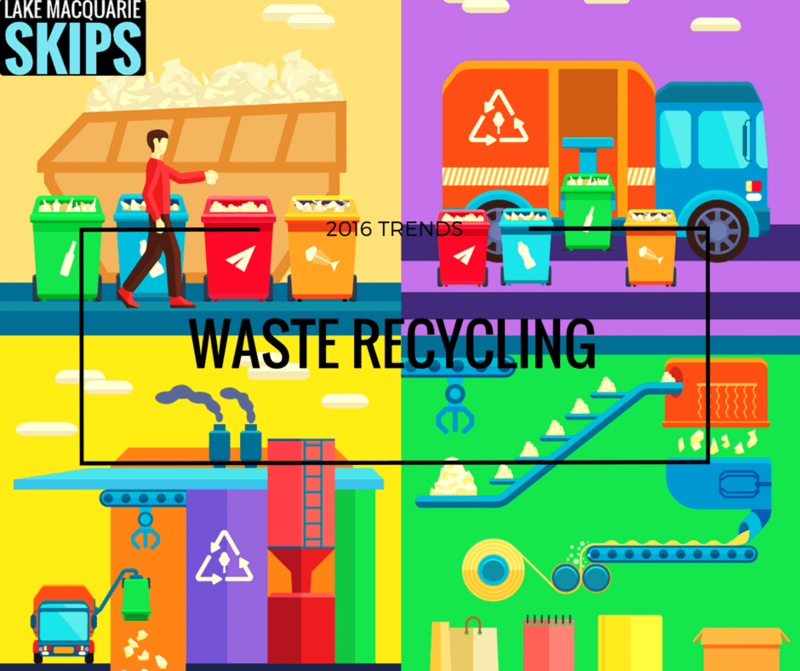 Below are some waste recycling trends that are emerging these days. Knowing these will help people adopt practises in order to, little-by-little, contribute to the waste reduction strategies of society. We all know how dreadful plastics are for the environment; they endanger wildlife, they don’t break down in landfills and in oceans, and they aren’t easy to recycle. That is why, although the nation does not have a blanket ban on lightweight plastics, many cities are starting to address these plastic wastes generated within their borders. Even Governments and local councils that are wholly opposed to full bans on plastic bags are looking at other possible alternatives to reduce plastic consumption, such as instituting a plastic bag tax, where consumers would pay a small fee for each plastic bag that they are going to use. Overall, Australians throw a total of $5.3 billion on all forms of food into skip bins per annum. This is 13 times more than that donated by Australian households to global aid agencies in the early 2000s which was approximately $386 million. These organic materials, which could otherwise be used as compost material, remain buried and unused under other forms of wastes in landfills. Right now, an increased focus on composting, particularly in areas where there is a need for compost to grow food, has brought opportunity for people to recycle their organic wastes (such as food) and turn it into a way to return nutrients back into the soil in order for the cycle of life to continue. As the issue of waste management moves up the political and environmental agenda, several sectors within the industry continue to respond with innovation. At the moment, the collection system continues to be a tricky aspect of the waste management process as a whole. Even with the existence of automated collection systems, there are still places that are left behind and desperately need efficient rubbish removal. For that reason, the number of waste removal companies seeking to answer the problem with easier and request-based services is rising. They are able to handle and provide skip bins for small projects like landscape and house renovations to big projects like full demolitions and high rise buildings. Additionally, some waste removal companies will organise the rubbish that they collect and find ways to recycle and reuse those wastes. There are so many ways to put the things that we now consider as ‘waste’ to good use. The current trends show that there is an increasing number of ways to respond to this issue. Phasing out and eventually banning non-environment friendly materials, using organic materials to help the soil sustain our vegetation, and hiring companies that seek to properly dispose of and deal with waste materials are the first steps to gradually protecting the environment. At Lake Macquarie Skips, we feature premium skip bins and rubbish management at a competitive price. If you live in Lake Macquarie, we are ready to provide you a skip bin for hire.